Who knew that vegetarian grilling was that popular? Steven’s book Vegetarians at the Grill is a best-seller in Holland. 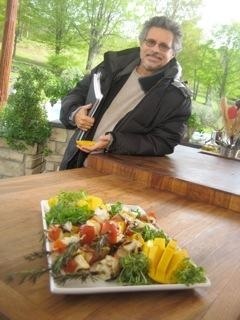 Here are some grilled cheese kebabs from the set of his French-Canadian TV show. To make the kebabs, use squares of tomato, pepper, onion, and a grilling cheese like Greek halloumi or Indian paneer. 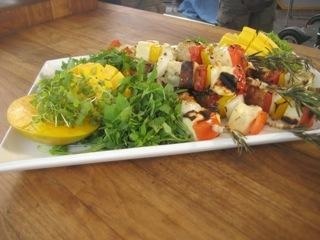 Check out the skewers–sturdy branches of rosemary, leaves stripped from the bottom to make room for the ingredients.